There are two popular ways of classification for survey data collection modes. The first one is based on the medium with which a data is being collected. The other one is based on the role of the interviewer. In the graphic and text below you can check which modes are supported by Nebu Dub interViewer. It is important to know that all those modes of data collection are available via a single user interface, a single scripting environment, collecting data to a single database, independent of the mode of survey data collection. Computer-assisted interviewing emerged to be the dominant mode of survey interviewing as technology and telecommunications services expanded the ability to reach those willing to participate in research. Nebu Dub InterViewer offers the most comprehensive solution for phone interviewing, combining web, the cloud and data management facilities to most effectively manage a call-center operation. The biggest benefit to web-based surveys is the speed and broad reach it provided as the next evolution in data collection. With the press of a button, users can reach thousands of respondents whereas previously the cost and timing were financially prohibitive. The ability to use programmatic functions in the interviewing process accelerated the time to field and amount of time in the field. Nebu Dub InterViewer is fully functional and offers a robust set of capabilities for inviting respondents to surveys, programming, data collection, management, and visualization. Nebu Dub InterViewer is fully responsive, meaning your online surveys created with Nebu Dub InterViewer are compatible with mobile devices, tablets as well as desktop/laptop. Users are provided with access to a responsive template that can be further customized for the look and feel. In a CAPI survey, a respondent completes the survey on their own, or interviewer assisted. This method is primarily used for on-site interviewing, whether it be at a sports venue, a factory floor or the terminal at an airport. Nebu offers an app for offline interviewing and synchronization of both surveys and collected data in the cloud. The traditional mode required the respondent to pencil in their responses on a paper questionnaire. In this approach, the questionnaire may be sent via postal mail and the respondent, therefore, is in control of when they return their completed responses, if at all. Another example of this mode, the interviewer reads the questions to the respondent and completes the questionnaire using paper and pencil. This mode was historically the way research was done but with the emergence of technology, the cost of doing face to face interviewing became increasingly restrictive and only for use cases that absolutely require it. Nebu Dub InterViewer supports all modes of data collection in a single user interface with a single scripting environment all collecting data to a single database, independent of the mode of survey data collection. Mixed-mode surveys became increasingly important as technology changed the way people communicated. The ability to use multiple modes to reach respondents in the manner of their preference is what predicated the use of this method. Dub Interviewer supports users need to run a single survey that might be administered by phone, web, or in-person. Multi-mode surveys use multiple data collection methods in parallel. The main benefit of multi-mode surveys is that the researchers can take the advantage of each of the various modes available in Nebu Dub InterViewer to achieve their data collection goals. Commonly known disadvantages of using multi-mode are that different modes may produce different responses to the same research question, and researchers must evaluate these differences. Nebu users don't need to worry about this, as those issues can be resolved with the support of Nebu Data Hub. With Nebu Data Hub seamlessly integrated with Nebu Dub InterViewer, you can clean and merge data coming from various questionnaires and sources, to make it all come together in a common database for further analysis. Multi-mode surveys are administered across multiple modes, to take advantage of reach and representation. For example, some customers might be elderly and not accessible via web survey, while a 20-year-old may not answer their phone to take a phone survey. Nebu Data Hub is a facility for merging and synthesizing data collected from any source to better facilitate data analysis and provide users with the ability to manage their data all in one place. 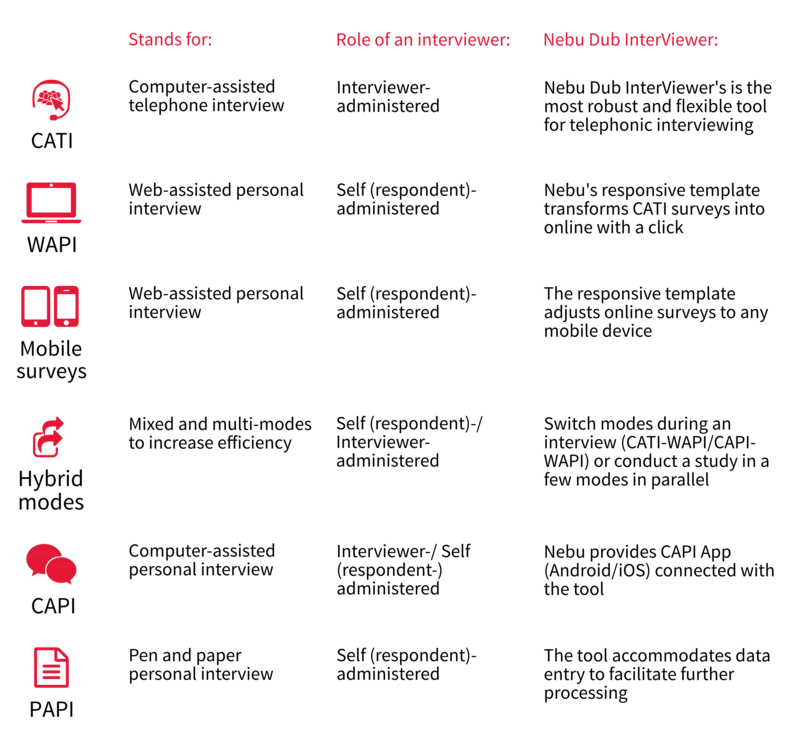 With Nebu Dub InterViewer you receive the ultimate tool for performing any kind of qualitative research you want. All of your questionnaires scripted (or imported) in the tool can be used as a CATI, online, mobile, tablet-based, f-2-f survey. Nebu Dub InterViewer is a fully hosted, 360º tool for advanced fieldwork and qualitative marketing research (non-ASP installations are possible). It consists of a few applications fully federated by a single user interface. 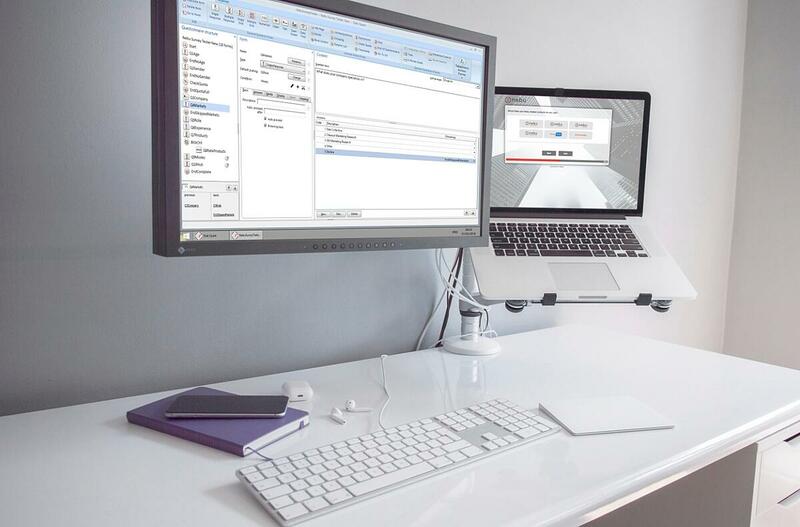 The single interface facilitates the use of any surveying mode to conduct projects, including the ability to mix modes within a single project or use multi-modes in parallel to each other directly from a single platform and resulting in a single database.